Gov. Sarah Palin on Wednesday praised John McCain as a "true profile in courage." Gov. Palin: Mr. Chairman, delegates, and fellow citizens, I will be honored to accept your nomination for vice president of the United States. 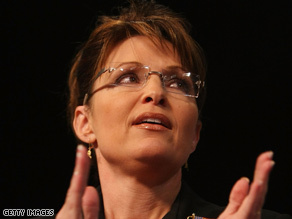 Will gender sway women to Palin? The voters knew better, and maybe that's because they realized there's a time for politics and a time for leadership, a time to campaign and a time to put our country first. iReport.com: What do you think of Palin's speech? I'm just one of many moms who will say an extra prayer each night for our sons and daughters going into harm's way. Our son, Track, is 19. And one week from tomorrow, September 11, he'll deploy to Iraq with the Army infantry in the service of his country. My nephew, Casey, also enlisted and serves on a carrier in the Persian Gulf. So Track is the eldest of our five children. In our family, it's two boys and three girls in between, my strong and kind- hearted daughters, Bristol, and Willow, and Piper. I am so proud to be the daughter of Chuck and Sally Heath. Before I became governor of the great state of Alaska I was mayor of my hometown. And since our opponents in this presidential election seem to look down on that experience, let me explain to them what the job involved. Well, I'm not a member of the permanent political establishment. And I've learned quickly these last few days that, if you're not a member in good standing of the Washington elite, then some in the media consider a candidate unqualified for that reason alone. But -- now, here's a little newsflash. Here's a little newsflash for those reporters and commentators: I'm not going to Washington to seek their good opinion. I'm going to Washington to serve the people of this great country. This was the spirit that brought me to the governor's office when I took on the old politics as usual in Juneau, when I stood up to the special interests, and the lobbyists, and the Big Oil companies, and the good-old boys. We suspended the state fuel tax and championed reform to end the abuses of earmark spending by Congress. I told the Congress, "Thanks, but no thanks," on that Bridge to Nowhere. This is a man who can give an entire speech about the wars America is fighting and never use the word "victory," except when he's talking about his own campaign. When that happens, what exactly is our opponent's plan? What does he actually seek to accomplish after he's done turning back the waters and healing the planet? Or you're trying -- you're trying to create jobs from clean coal, from Pennsylvania or West Virginia. Harry Reid, the majority of the current do-nothing Senate ... he not long ago summed up his feelings about our nominee. He said, quote, "I can't stand John McCain." But if Senator McCain is elected president, that is the journey he will have made. It's the journey of an upright and honorable man, the kind of fellow whose name you will find on war memorials in small towns across this great country, only he was among those who came home.